Super cars don't come much more dedicated than the Ariel Atom 3, a car that's fast becoming a legend. And if you're a dedicated driver they don't come much faster, as we found out at rainy Lime Rock last weekend. Yes, super cars certainly come prettier in the conventional sense, but they have "bodywork." The Atom pretty much has shrouds that cover the hot parts and the moving pieces, at least most of them. They come more luxurious, but they have "interiors" where the 1375-pound Atom has a pair of seats — really, with its open frame, it barely has an exterior. But if you're the right sort of driver, it looks exactly like it should — see, right there's the engine, there are the Bilsteins, there are the brakes (Alcons on our example), and there are the tires (Toyo R888s) — and it's exactly the right place to be. It's a tool, and like a chef's knife or a stonecutter's mallet, it's made as simple and direct as possible with nothing added to it that you don't need to generate velocity along the appropriate axes. Unfortunately, gorgeous Lime Rock Park was not quite the place to be on Saturday, as it had been drizzling steadily all day and the track was a glistening piece of black snakeskin where there wasn't actually standing water, so we would be limited to a few laps on the autocross track. This was disappointing, but it gave me time to talk to the people from Trak Motorsports International, who took over building the Atom from former owners Brammo last year; they'd already after handled the Ariel Atom Experience driving events for them and knew what they wanted to do with the car. Primarily, they decided to replace the Atom 2's Ecotec, which was serviceable but still a compromise. They went back to the Atom's roots with a version of the K20A two-liter four found in Japanese-market Civics, a potent engine that makes 245 horsepower normally aspirated or 300 with a Jackson Racing supercharger. "It's a serious little engine, a race engine," TMI's engineer told us, "no balance shafts, baffled oil pan, Hondata ECU." It shows; the Atom has never in its short existence been anything like slow, but the supercharged Atom 3 gets to 60 in under three seconds. It's now a much more useful speed tool, and it's still relatively cheap to own and operate. I wasn't able to approach that on the autocross track, naturally. On my own raggedy laps, the engine was flexible enough that it could be left in third and dart around just fine. TMI vice president Mark Swain had told us that the car was a very direct and transparent instrument-"It will do exactly what you tell it to. Exactly," were his exact words. My limited and damp time in the five-point harness proved him correct. The Atom turns in immediately; don't cough or twitch. It accelerates immediately; be prepared. And it stops the same way, except when it stops while going backwards because you weren't paying attention to just how quickly it turns and accelerates-but even then, it's just doing what you told it to, like Swain said. There is definitely as much speed there as you can get out of it. Like any tool, it reveals the strengths and shortcomings of the tool-user; you can use a chef's knife to prepare an epic feast, or you can take your hand off at the wrist. Later that afternoon a dry line opened on the track and Swain, who turns out to be an extremely fast and smooth driver for a vice president, was allowed to take us for a handful of laps around Lime Rock lovely mile-and-a-half to give us all more of a feeling for its potential. I expected the Atom, at speed on a larger track, to feel darty, frenetic, and nervous, but that didn't seem to be the case; the still-damp track didn't upset it even through the water flowing across the track, it took the transitions through the esses in stride, and despite the astounding speed it seemed composed and solid. The Atom may have been running out of steam at the end of the half-mile straightaway, as top speed is "only" 140 or so, but it was never straining. So if you're dedicated enough, or have the patience to try and become driver enough, and you have $65,000, by all means, get an Ariel Atom 3. It's a phenomenal track car, and in some places it could be a unique and character-building road car. It's certainly the sharpest and simplest — and cheapest — tool in the supercar trade. One way or another, you'll be a better driver for it. 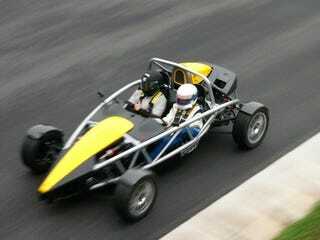 Special thanks to the Manhattan Car Club and TMI AutoTech for providing the Atom and track time.